Rock and metal music are best enjoyed on live shows, concerts, and festivals. Since these are relatively “rare”, give or take a few local gigs, the second best way to enjoy your heavy music is on headphones – PCs and sound systems might provide you with volume, but not with the depth needed to appreciate every little detail. We’ve compiled a list of the best headphones for metal and rock music for your convenience, so let’s see which models we’ve labelled as the finest for the buck. Balanced soundstage: Rock and metal musicians include the highest rate of virtuosos in comparison to other music genres. What affirms this statement is the fact that most popular rock and metal songs tend to jump from and between frequencies. You’ll need headphones with a balanced soundstage if you want to grasp every little bit of your favourite tracks – the bass won’t be heard properly if the lows are bad, the percussions will seem murky with indecent mids, and good luck enjoying the vocals with bad highs. Neutral sound signature: Most people think that “heavy metal” and “metal” are synonyms, and the same goes with “rock” and “hard rock”. Aside from the experimental, obscure genres (drone metal, indie rock, etc), most rock and metal sub-genres are actually characterized with pinpoint precision and accuracy. That means that owning a set of headphones with a neutral sound signature will allow you to hear the songs in the manner the band (or a performer) intended it to be. Bass-heavy headphones will snuff out the rest of the frequencies, crispy accentuated highs will drown the lows, and so on. 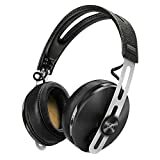 Quantity and quality of sound: The first thing people notice about rock and metal songs when they use a proper headphone set is that there were parts that they never heard before. Plain, subtle passages are frequently slipped into the mix by professional sound engineers, so if you wish to explore the true depths of rock and metal, you’ll need proper headphones. The “quantity” of sound refers to these “plain side passages” which you’ll only hear if the headphones are good – sometimes it’s in the smallest of details, such as a single eighth of a note strummed in an octave. The “quality” of sound, on the other hand, is quite self explanatory. Let’s start with Sennheiser’s HD1 wireless headphones. Now, it’s true that they’re quite expensive, but we can assure you that these headphones are meant for metalheads and rockers – they feature the exquisite NoiseGard active noise-cancellation feature which blocks away environmental sounds with four microphones. They’re also very sensitive, which means that you will start to notice sounds and parts in your songs that you never knew existed. The battery lifetime is pretty long too – you can use them for up to 22 hours on a single charge, making them a perfect travel companion. Further on that note, they only require approximately three hours to get the juices back up. There are two integrated microphones onboard which seamlessly work to improve the overall quality of sound while keeping the ambient voices away. The sound quality of Sennheiser’s HD1 is top-notch – you can blast off your favourite tracks and you’ll get excellent audio at all volumes. To top it all, the soundstage is all-around and balanced, and they offer bleeding-edge noise reduction technology to preserve it. The only real issue you’ll have is that this model costs quite a lot. It belongs to the upper end of the “expensive” price point category but boasts a considerable value for the cash nevertheless. Sennheiser’s HD1 is for those metalheads and rockers who don’t shun away from spending a little bit extra on top-shelf gear. Though expensive, you won’t find a better sound in the price range, guaranteed. If Sennheiser’s HD1 is too expensive for you, the HD 650 is just a bit more affordable and offers a similar set of benefits. It looks old-school and features acoustic silk which keeps the ambient noises at bay in the most natural way possible. The frequency response spans from 10 Hz to 39,5 kHz, which is something only boutique-level headphones can boast about. The drivers are powerful and offer high-fidelity, yet accurate audio while the neodymium magnets promise nothing short of perfectly smooth sound emission. Powerful, sleek, and durable, the Sennheiser’s HD650 can match the tremendous sound quality of the HD1. If you liked our previous pick but fell short on couple of bucks, this is a perfect option for you. Sennheiser’s HD650 is just slightly less comfortable than HD1 – it features neat earmuffs, true, but they’ll eventually cause some fatigue ever prolonged use. Great for the buck, although we can’t deny the expensiveness of this beautiful headphone set. They promise much in terms of sound quality, ambient noise reduction, and durability, although they can’t match the comfortability of Sennheiser’s HD1. V-Moda’s Crossfade looks mean, and it’s practically tailored for metal and rock fans. It features an integrated microphone with voice recognition software and packs a 12-hour Li-Ion battery which can recharge in approximately 100 minutes. 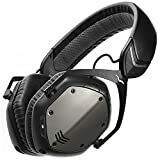 The dual-diaphragm drivers outfitted to the Crossfade make it one of the finest headphones for rock and metal music, as they provide powerful, accurate audio transmission. It’s puzzling how such a powerful headphone set can feature a neutral audio signature – every little detail you hear in your songs will appear more epic, more accurate. If you like blasting your music in “pedal to the metal” fashion, this is the set you’re looking for. It’s true that Crossfade brings a lot to the table, but the one thing it’s missing is the convenient design. Notably, these headphones are a bit too bulky for comfort. Set aside the bulkiness and you’ll have a perfect headphone set for rock and metal music. There are but a few models in the price range that could match Crossfade’s power and audio accuracy, so it’s safe to say that it’s well worth the buck. We’ve saved the best for last – you didn’t know that Marshall also makes headphones, now, did you? 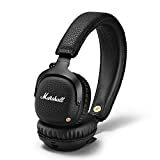 Essentially, Marshall’s headphones are wireless and allow you to enjoy in your favourite tracks for up to 30 hours in total. They’re outfitted with custom drivers that provide unique, exquisite sound. If a brand that’s been supplying young rockers and metalheads with premium gear for decades doesn’t know what’s good for them, then no one does. They’ll give you the rock & roll look as you wear them, they’ll give you the sound you crave, and they don’t even cost too much – is there anything else a rocker needs? Leather is pretty metal – it’s durable, it’s dark, and it never goes out of fashion. However, leather isn’t as comfortable as memory foam, and these headphones are made of the former. Hands down, Marshall’s headphones are, without any doubt, made for rock and metal lovers. They’re available at an approachable price, they’re well worth the money, and they boast excellent audio quality. We’d only like to see a model made of different materials, though. Metalheads and rockers, we completely agree with you that finding a decent set of headphones for the buck for your favourite music is harder than most people think. These music genres are unique in every way, and that’s not what most brands think about when making their headphones. On the other hand, there are but a handful of brands that you can trust – we’ve included them in our review of the best headphones for rock and metal music, so just kick back, grab a cold one, and take your pick. Marko Buskevits - editor and writer at WhoisHuman is a 34 years old tech blogger and former musician from Belgium. His writing work has appeared in countless venues over the last 10 years including TechCrunch, CNET and Forbes. whoishuman.io is a participant in the Amazon Services LLC Associates Program, an affiliate advertising program designed to provide a means for sites to earn advertising fees by advertising and linking to Amazon.com.